An apartment building for 7 families located at the corner in residential area. By creating the piloti connected to the frontal residential roads, the building has the open public space on the ground level. 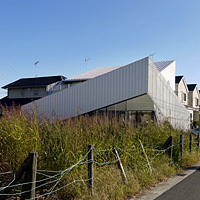 The mass of the building was designed by calculating the ratio of the viewable sky from the road. As a result, the building has the uneven skyline, open sky balconies, piloti and staircase that penetrate the mass. The uniqueness of the each residents would appear on the facade and become a part of the streetscape over time. 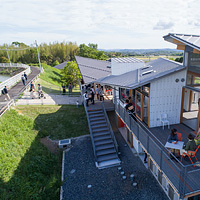 A vocational aid center in Nagasaki. 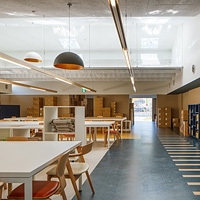 Based on the research of the activities in the existing vocational aid center, and focusing on the light environment, the sloped ceilings were designed. That reflects the natural sunlight in various ways. Zigzag shaped roof creates the sloped ceilings and the interior one-room space is devided into a couple of spaces by those ceilings so that various activities could fit into one space. The custom-designed furnitures also create the spatial variety. 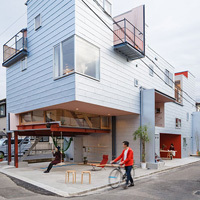 This house is built in residential area. To secure light of garden, we form different direction and height of 3boxes.Between adjacent land and shed, we set the shed forward to existing house. By do so, garden is shaped as if alley. 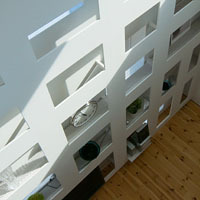 To connect living room toward garden, we make bay window, terrace, pergola. It succeed to develop interior to exterior. This project is planned as sake warehouse among new residential area and commercial strip in Tsukuba. 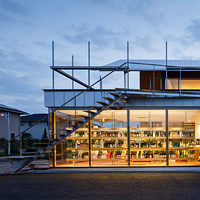 We separate and decompose architecture 3 volume to logistics storage・office・sake store. Terrace has opened to Mt. Tsukuba and there is floating from sidewalk eye level which the traffic is busy. Sake warehouse has function as store in local business and as logistics base connection between sake warehouse to customer. Addition of an annex in a small garden. There is an existing wooden modernism house of a late poet in the property, and the request for the addition was a space that could be open to public occasionally. For that reason, we designed the new space as an annex that is apart from the existing, and the space becomes completely open to the exterior by sliding all the doors. It would work as a pocket park in the crowded residential area. 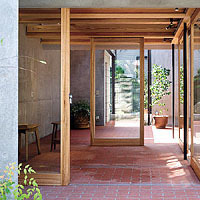 There is the small exterior space in between the existing dwelling space and the annex space so that the both spaces merge into the exterior. The wooden buildings were Japanese tea manufacturer's house, factory and storehouses. And those buildings were built over 100 years ago. 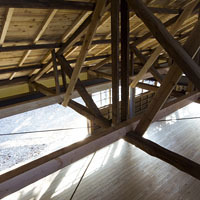 We restored the wooden buildings and changed a room to the office for a national trust organization. Since the buildings are historically important, the client had been decided to register the buildings as a cultural property. After the restoration and alteration, the three buildings in the property were designated as National registered tangible cultural properties (Structures) on June 21, 2013. Renovation of a three-story steel house. This house is for the couple who would like to live on the floor without tables and chairs but with a few Futons. Generally, atmosphere of interior dwelling space is created by furnishings and light coming in, rather than architectural finishes of floor, wall and ceiling. Since they don't want to put any furniture on the floor, we built another wall inside of the existing exterior wall so that the wall creates the atmosphere by setting the light and the furnishings into the walls. The light through the small windows becomes indirect light by reflecting in-between the walls, and the indirect light fills the space. A two story building of an animal hospital and the veterinarian's house. We created several gardens around the building - garden for animals, backyard, garden for the dweller. Since those gardens are narrow, we rotated the building and created trapezoidal gardens so that those gardens could be wider space. The top/bottom edge of the metal screen at the site border changes in response to the surroundings and trims the view toward the outside of the site. 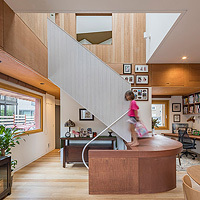 Renovation of a two-story wooden house. 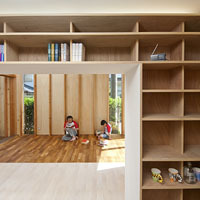 A library and a study for the poet husband and an atelier for painter wife were requested. 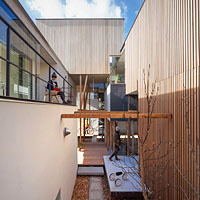 The atelier was added in front of the house as tunnel-like space to create a view toward the hedge along the street and the trees of the neighboring house. We thickened the existing exterior wall and create the book shelves. 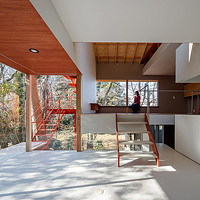 By thickening the existing exterior wall, the openings of the wall becomes veranda-like space, and those openings connect the existing interior space and the exterior space / new atelier space moderately.